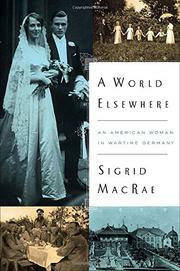 An American woman’s marriage to a Baltic German noble in 1928 promised a fairy tale but ended in a nightmare of war. New York City–based author MacRae (co-author: Alliance of Enemies: The Untold Story of the Secret American and German Collaboration to End World War II, 2006) is the daughter of now-deceased Aimée Ellis of Hartford, Connecticut, a wealthy young orphan swept off her feet by a handsome descendant of the Teutonic knights once closely allied with the Russian czars; his elaborate name was Baron Heinrich Alexis Nikolai von Hoyningen-Huene. A polyglot with impeccable manners and education, Heinrich was ambitious as well as irresistible; he and Aimée met while on holiday in France in 1927, when Heinrich was studying international law and economics. Aimée had studied art in New York rather than attend college, and when the couple married the next year, she was several months pregnant. The couple made a home on a big farm in a town about 100 miles outside Berlin, during the painful period of crisis and unemployment in 1930s Germany. Heinrich had the right stuff for the rising new Nazi regime: military lineage, Aryan pedigree, an attachment to the land, and a large, growing family. Although thwarted in his professional ambitions and attempting to settle down as a gentleman farmer, he joined the Nazi party and was mobilized and eventually sent to participate in Operation Barbarossa, where a sniper killed him at Mogilev on July 23, 1941. Aimée, left pregnant with their sixth child, had to soldier on under terrible conditions, fleeing her town when it fell under the Russian sector; she eventually brought her children back to America in several trips. Using her parents’ letters written during this devastating time, MacRae does a fine job of portraying the fear and uncertainty felt by her mother, living in a strange land and torn by loyalties. One of the more curious World War II entanglements, deftly fashioned.